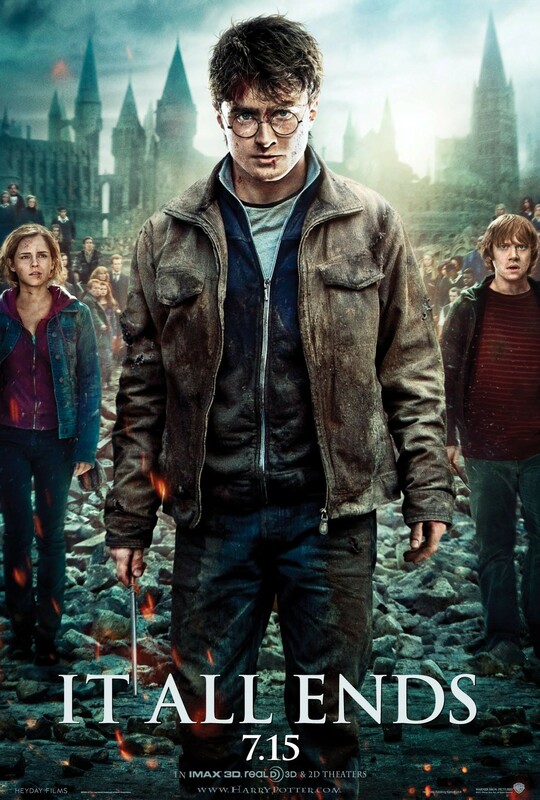 I was emotionally devastated to watch the Harry Potter and the Deathly Hallows, Part II last night at 10:00pm. A thousand thoughts were running through my head as we sat in the second row of Regal Cinemas in LA Live, watching the 130 minute countdown towards The End. This final movie is bittersweet and heart-wrenching - not because I particularly enjoy the Harry Potter movie series, but because it puts a definitive close on a chapter of our childhood. I was 9 years old when my dad bought me a copy of Harry Potter and the Sorcerer's Stone, which opened me to a world of magic. For me, "magical" was not even a big enough word to describe the novels. Today, the paperback version of the book I own is a tattered mess with pages falling out - a testament to how often I have reread the novel. Ten years ago, the summer before I started 6th grade, I truly believed that I was going to get an owl with an admissions letter to the Hogwarts School of Witchcraft and Wizardry. I would be whisked away into a world of magic - a world of excitement and limitless possibilities, a complete antithesis to the mundane suburbia in which I lived. My dreams of attending Hogwarts never materialized, but I never wavered in my religious devotion to the antics of my childhood best friends - Harry, Ron, and Hermione. I nearly cried during the "19 years later" scene, which featured Harry, Ginny, Ron, and Hermione standing on the platform of Kings Cross Station, sending off their children on the Hogwarts Express. As if the thought of graduating from college in less than a year and entering the realm of adulthood weren't hard enough, I just watched the door shut on the past 12 years of my life last night. 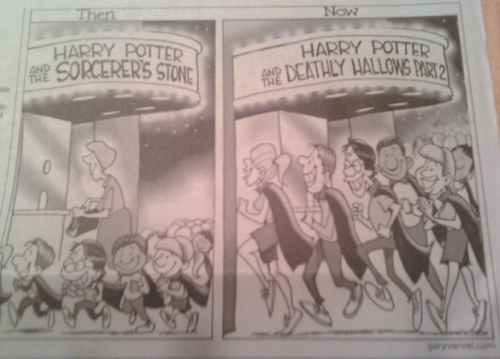 My younger brother's generation will never truly understand the extent of Harry Potter mania. Gone are the days of midnight parties to celebrate the release of Harry Potter novels. Gone are the days of donning taped spectacles, drawing thunderbolts on our foreheads, buying gear in scarlet and gold, reading Mugglenet religiously, and truly believing that a magical world exists beyond the walls of Platform 9 3/4. Gone are the days of eagerly anticipating the next saga of Harry Potter's adventures in his quest to champion good and vanquish evil. With that, I bid thee farewell, Harry Potter.